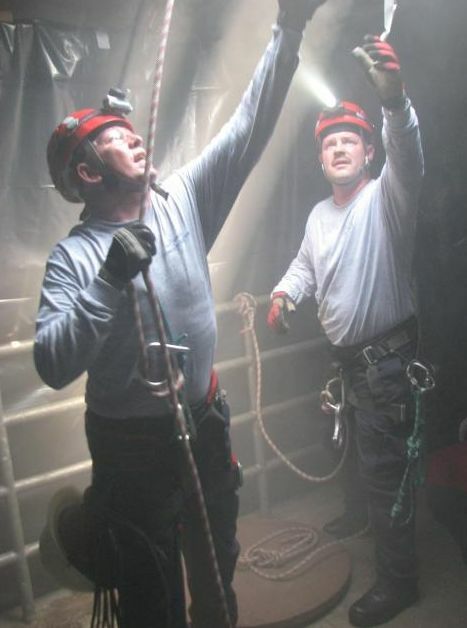 Photos Courtesy of WF&R : ©2010 www.nelsoncountylife.com : Members of Wintergreen Fire & Rescue perform a simulated vertical rescue in low light and temperatures exceeding 100° last weekend in Virginia Beach. Click to enlarge. 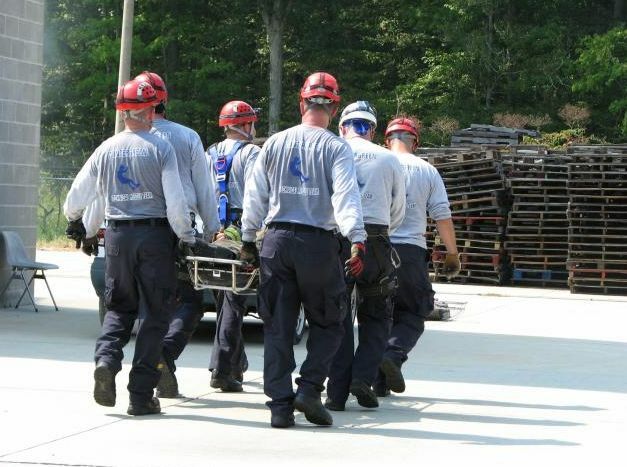 Last weekend, the Wintergreen Technical Rescue Team traveled to Virginia Beach for the annual state competition. “This is the best way for us to know if we are performing proficiently and safely. The judges are the top instructors from all over Virginia,” says Curtis Sheets, Chief of Wintergreen Fire and Rescue here in Nelson. The team was given a complex problem involving multiple patients below grade, one of whom needed to be hauled out using a mechanical advantage (series of pulleys) The team finished the problem with eight minutes remaining, only missing 3 out of 100 points, placing third overall. Wintergreen Fire and Rescue team members carrying out a mock patient during the state competition in Virginia Beach. Mike Riddle competed in the EVOC (Emergency Vehicle Operator Course) competition which is one of the most difficult contests at convention. “The EVOC judges take great pride in setting the course to be nearly impossible to complete. There is also a written test component to this contest. Mike finished third,” Chief Sheets continued. Wintergreen also submitted one of their MVC (motor vehicle crash) calls from Route 151 for consideration in “Outstanding ALS (advanced life support) Call of the Year”. They placed second in this category. “Our website (www.wtgfireresq.org) placed sixth out of the many sites submitted from across the Commonwealth. (Nice job Mike! ),” Chief Sheets tells us. Chief Sheets said the guys practice hard for the state competition. The end result is a group of people (some from each shift) are more ready to respond to technical challenges such as roof-top emergencies, ski lift accidents, rock climbing accidents, below grade vehicles, etc. “Also worthy of note, the Staunton-Augusta Rescue Squad was again named “Outstanding Agency of the Year”. Since roughly a third of our staff are now, or have been affiliated with SARS, this is nice validation for us as well,” Chief Sheets ended.